The village of Krymske lies close to the contact line. The conflict has turned the lives of local residents into a continuous challenge. Because of the shelling, their homes have been damaged or completely destroyed, the water system is not working, and last winter the villagers had to survive the freezing cold without gas supply. From time to time escalations in hostilities force people to spend the night in their basements. To reach this village is also not easy: the dirt road to the new regional center of Novoaydar goes through a deep ravine. In winter time and when it’s raining, the road becomes an unsurmountable obstacle for almost all kinds of transportation, and even bringing humanitarian aid to the population of this isolated village is not always possible. Such self-reliance forced the Doroshenko family to spend last winter freezing temperatures in a small summer kitchen, equipped with a tiny heater which works on firewood. 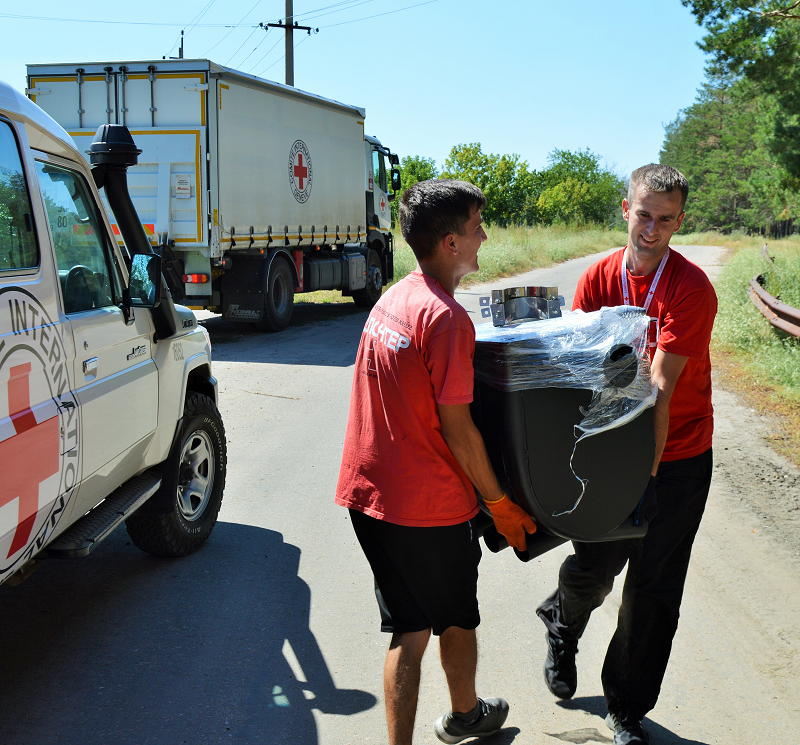 Last summer, the International Committee of the Red Cross (ICRC) delivered heating stoves to the Doroshenkos and other 60 families. One such stove can heat up to 100 square meters and can also be used for preparing food. Next winter, the family will not have to move to the kitchen. Before the winter begins, 555 more families along the contact line will receive new heating stoves for their households. “Thanks to you, we now have both something to cook and something to cook on. We have our meat and vegetables thanks to you”, says Tatyana. 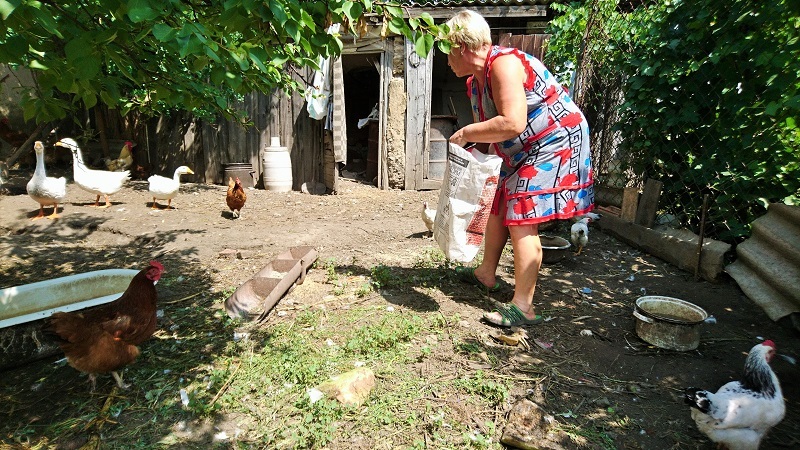 Last spring, the Doroshenkos and other 578 vulnerable households along the contact line in the Luhansk region were given chicken and chicken feed. “Furthermore, thanks to the incubator, which we received in early spring, we now have 25 geese in our yard. This summer – a new gift, for which we are particularly grateful: a grain crusher”, says Tatyana pointing at the machine which rapidly grinds corn or other grains. The Doroshenko family is not the only one to have received such a device. All in all, the ICRC has delivered 215 incubators and 177 grain crushers to families living in isolated villages. Crushed fodder is consumed more easily, and the villagers who raise chicken can make some savings. 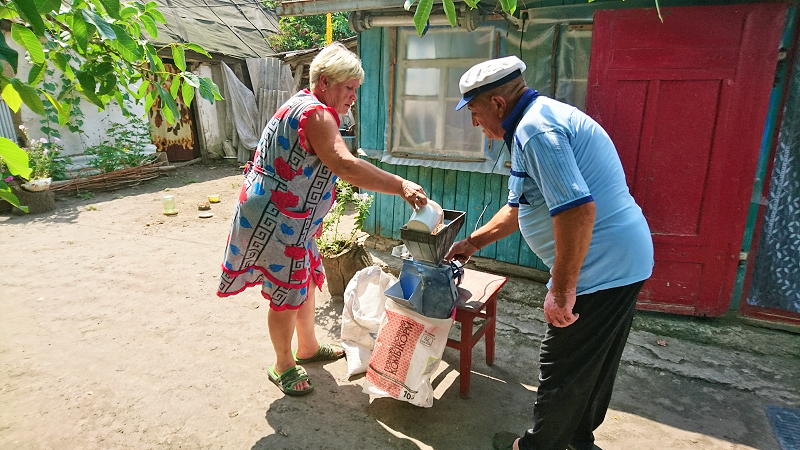 Valentyna and her mother, also residents of Krymske, lived off selling milk until the conflict started. Even today, notwithstanding the fact that the fields across the village are mined and grazing cattle is not so easy, they are maintaining ten milking cows. “Both our cowshed and our house were damaged in shelling. And our cows now fall sick more often than they did before. In spite of that, we don’t give up. We are thinking – they are helping us today, and maybe they will continue to helps us”, Valentina tells us during the distribution of equipment for increasing the quality of milk and repairing barns. Her hopes are not unfounded, as the ICRC project to support livestock maintenance also previses distributions of creamery machines and equipment for cooling milk. 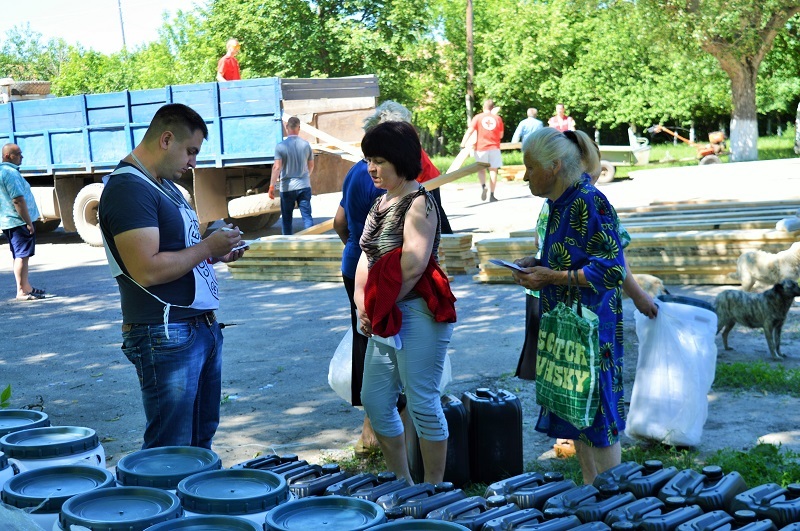 Life in Krymske goes on despite the challenges. Tatyana, Valentina and many other families in this village carry on, rely on themselves and work hard. We are glad to give them a helping hand.